Yesterday the new president of the United States swung by the White House to check out his future home and to meet with Barack Obama. The two gave positive feedback on their meeting – Obama called it ‘excellent’ and ‘wide-ranging’, while Trump said the two had ‘great chemistry’. He went on to say that he was ‘looking forward to dealing with the president in the future’, while Obama claimed he was ‘very encouraged by the interest in President-elect Trump to work with my team’. But according to top body language expert Patti Wood, their body language, facial expressions and hand movements told a very different story. According to the Daily Mail, She said Obama was ‘extremely fatigued, resigned and not hopeful’, while Trump was ‘tentative, serious and perhaps fearful’. She added that the ‘alpha male’ game was won by Obama as he had the widest leg spread. 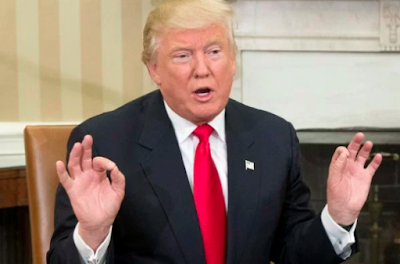 If you look at the president-elect’s hands they’re in a downward prayer position which shows he’s being tentative. Although they both appeared relaxed Obama couldn’t hide the fact he’s not entirely okay with America’s decision. It worries him. Wood said Obama resting his arms on his legs is a sign of feeling ‘weary’. However, during Obama’s statement, he said he was encouraged my Trump’s enthusiasm. But Wood said his eyes conveyed the opposite. ‘There is a part where he says he has been encouraged. As he says it he closes his eyes. I call that an eye block. That tells me he doesn’t feel totally encouraged,’ she said. 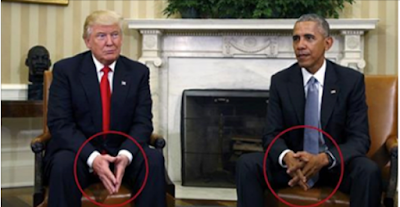 The body language expert believes that when someone clasps their hands together it means they are trying to comfort themselves in some way. And when Trump clasped his hands together it meant he was trying to ‘comfort himself’. Apparently, Mrs. O and Melania met in private if only Wood was there to tell us what he really thought. If you are interested in body language. The clip below is really interesting.